The notorious Red Raven has stolen the Vernal Key, a magical artifact essential to the survival of a remote community. Now you must pursue this cunning bandit as he makes his escape across some of the most unforgiving terrain in all of Golarion, but the trail leads straight toward a treasure hoard and a magical guardian encased in an ancient prison of ice. By the time you catch the Red Raven, justice might be the last thing on your mind. 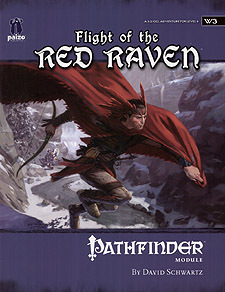 Flight of the Raven is a wilderness-based adventure for 4th level character compatible with the world's most popular roleplaying game. This dramatic chase adventure takes the characters through unforgiving wilderness to the remote Fog Peak Mountains, where an ancient evil that has been imprisoned for centuries hopes to finally make his escape. This adventure takes place in the revolutionary nation of Galt in the Pathfinder Chronicles Campaign Setting. For more information on Galt, as well as the other nations of Golarion, be sure to check out the Pathfinder Chronicles Gazetteer.